NSA has teamed up with FecpakG2, Cox Agri/Richey and JG Animal Health to give away three £200 vouchers at a free prize draw giveaway every other month this year. New NSA members are automatically entered into the draw, as well as existing members who have recommend a friend or neighbour to sign up to the sheep farming association. Cathryn is one of three winners in the penultimate prize draw for 2016. 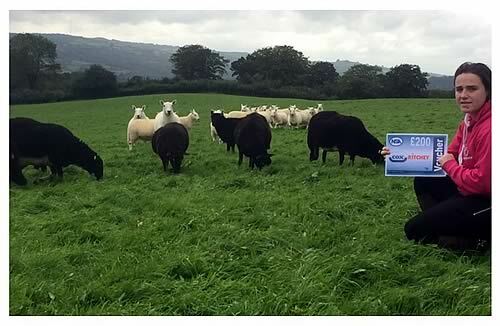 Shepherding is a growing passion for Cathryn, who lives near Bethlehem, Llandeilo, Carmarthenshire. She has built up her current flock of Welsh Mountain Badger Face sheep, favouring the Torwen type within the breed since receiving a single breeding ewe as a gift from her mum when she was younger. Cathryn now plans to add more of a commercial side to the flock and recently purchased a number of Welsh Mountain ewes, which she’ll lamb this coming season. Cathryn runs a closed flock, which means she keeps a number of ewe lambs back each year to use as replacement breeding females in the future. The main of her ram lambs are sold at breeding sales, including NSA Wales & Border Ram Sales. With stock management at the forefront of her mind, Cathryn says she is looking forward to putting her £200 Cox Agri/Ritchey voucher towards various everyday essentials to improve her flock.